Finaly! a Program That Teaches You Dabke!Never sit out and miss the fun again! Have you ever wondered what may be holding you back from learning and being great at Dabke? From being confident and joining in the fun at weddings and parties? Are you ready to let loose and really enjoy yourself? Are you ready to learn Dabke that connects you with your culture, your friends and your family? Are you ready to learn Dabke that will get you attention from a potential husband or wife? Maybe the attention of a group of guys or girls? My name is Samir Hasan, and with the help of my student Youssef, I am here to help you! Here is the thing…Training dozens of people to do Dabke and personally performing in hundreds of shows has given me a rare insight into how to perform and teach Dabke moves from many countries including Palestine, Iraq, Lebanon, Jordan and the Gulf. 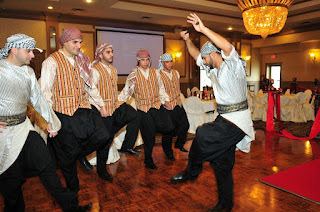 I’m about to share with you some common errors along with my collection of Dabke moves I’ve called “Dabke101″ which I think are necessary for people to know if you are attending any Arab Wedding or Party. LET ME TEACH YOU HOW TO DABKE! On this very page you are reading at this very moment, I’m going to reveal to you the most efficient teaching methods for quickly learning Dabke while training in your own home at your own pace! WARNING: There are no pills or potions and this will take some hard work, so if you’re looking for a magic-fix then you’ve landed on the wrong site. But if you are looking to have great fun, learn all sorts of Dabke steps, moves and routines from someone who has spent 15+ years in the industry then you’ve come to the right place.